Les Paul Recording II 72´ Help me i need more information about this. According to Tony Bacon's book 'The Les Paul Guitar' there were approximately 5,000 LP Recording version II's made and just over 1,300 of these were made in '72. It wasn't a 'special edition' per se; it simply just wasn't a high-volume seller by its very nature; most players did not need - nor want - the lo-impedance pickups and circuitry. Value? No one can say with any degree of accuracy. Depends totally on where you live; how many purchasers might want to buy; how many guitars are for sale at any one time and so on. You could check completed eBay listings in the country in which you live but that will still only give a rough idea of what some sold for in the past - not a guarantee of how much yours might sell for in the future. Hi, I think your guitar is actually a 1974. My reference book only shows serial numbers beginning with 3XXXXX for 1974. Also,1972 was the first year that the Les Paul Recording was introduced. The first year the guitar had an ABR bridge, yours has the harmonica bridge so it likely isn't a 1972. Gibson serial numbers from this era is all over the place, so nothing is for sure. Your guitar has low impedance pickups in it, this was Les Paul's secret to his tone. In 1968, he gave Gibson his secret. 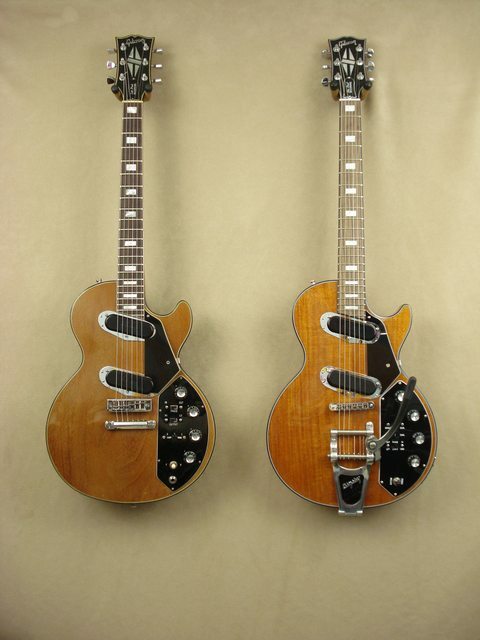 They came out with the Les Paul Professional & the Les Paul Personal around 1970, they didn't catch on mostly because artists like Eric Clapton had popularized the sound of a high impedance Les Paul overdriven by a Marshall Stack etc..... Times had changed & people were not as interested in a guitar with incredible clean tone a unbelievable harmonics. The first guitars were extremely heavy & you needed a special transformer chord to play it in a normal high impedance amp. Your guitar is the second version for the low impedance Les Pauls. It was a bit lighter & has a built in transformer so you can switch from low to high impedance. The Les Paul Recording II is actually a recent model. Gibson came out with a reissue around 2013. It looked similar but had high impedance pickups with a transformer to adapt it to low impedance. I have a 1973 Les Paul Recording & the 2013 Les Paul Recording II (sometimes referred as the Les Paul Irridium). Where's the German guy that used to post on here that has one of these guitars (at least one)? Sorry, the name escapes me but not seen him for a while. I believe Bence is from Hungary, Dave Gould is from England. The three of us make up the largest part of "The Gibson Low Impedance Club" in the Vintage Corner of this forum. Not much action lately. Yes, you are right Bence is Hungarian but I haven't seen him post for a good while. I have long fancied a Les Paul Recording but for me it would have to be the model (whichever one that is) that has the "tone change" switch as I believe most of them don't have this facility. The main electronics stayed pretty much the same, with the exception of the high/low impedance switch on the Recording models. The three position Tone switch & the Decade switch are on all of the 60's & 70's models. Thanks for those links Grog. Much appreciated. The instrument in question looks like a Recording v.1. Version 2 was made between 1978-1980 with the "standard" body shape. 256 examples in total. Version II (Iridium model) is a recent reissue with modern features. You might look at the codes on the pots. Part of that number is a date code. If they are original, and most likely are, that should give you a close approximation of the manufacture date. And I would look at all of them, they should all be very close in dates. I have a pot sitting here, the last 4 digits are 1510, means 10th week of 2015. You can go here and do a search on the code, should tell you the manufacturer and date. 1937 Gibson L50 "Black Special #4"
Glad to see you still around Bence (not saying you haven't posted but I haven't noticed any posts). Yes, I have been away for quite long time. I've got lot of work to do these day. I try to be present a bit more, if I can manage. Judging by the serial number and comparing with mine it is definitely not '72. More like '75 - but that is just guess work. Nice condition apart from the output socket. Bence, what do you mean by 256 examples in total? Do you mean only 256 guitars ( Second Edition) were made? I'm trying to identify a LP I just bought. It has been modified and is peculiarly shaped. Under the stamped serial number on the headstock is stamped the word "SECOND"
I havent removed enough finish yet, but I would guess underneath the word SECOND I would expect to find the word EDITION. This guitar is really perplexing me. Would you mind taking a look at my thread? I would really appreciate some opinions/guesses that you might have. Thanks. One of the telltales of the Recording seems to be the angled pickups. Did they all have them? The controls on mine are kind of mind boggling - on closer inspection there seem to be 7 holes, one for existing control and 6 more that have bern filled in. Customer support seems to think it's a 1997 LP Custom - witg the neck placed on a different body, though they couldn't confirm it. They also said "SECOND" meant it was a factory second - but I've yet to find any mention of Gibson stamping the word on it. - they always used the numeral 2 or the word CULL. Reckon I just gotta strip more paint. I just needed to know because if its an LP Custom ( as customer support says ) then I have lots of options as to how to rebuild it. If it were a second edition LP Recording - well those are so rare, I would want to be that much more meticulous in the rebuild. Thanks for the responses in this and other threads. All of the Les Paul Recordings had the pickups at an angle and the end of the fret board was also angled. I have read where some guitars that didn't sell as quick as they would have liked were stamped "SECOND" just so they could sell them at a discount. Having a Les Paul Custom headstock but no binding on the body is also odd. Could the binding have been routed off & refinished? Johnny 6 String in my other thread said it looked like a Washburn Idol body, and that makes a lot of sense, after looking at pictures of those. And it could also explain the Washburn Wonderbar tremolo bridge. ( which I LOVE - it's baddassed good. ). Thanks for responding - this forum/community is awesome. Sorry for the double thread, but when I saw this one, I figured there was a better chance of drawing out some talent. Here's my original thread with the pics, and a couple more great responses.You guys rock!! !